We’d love your help. Let us know what’s wrong with this preview of All the Dark Corners by Emerald O'Brien. But when she arrives Samantha Tillman had one rule after leaving Crimson Falls: Don't look back. To ask other readers questions about All the Dark Corners, please sign up. What an amazing short story! You don't want to be in Crimson Falls in October. Bad things happen. Sam grew up there, but left as soon as she could. This story was full of twists and turns that I never saw coming! I loved All the Dark Corners!! It was full of mystery and intrigue. I loved how dark and suspenseful it was. It could totally be a Lifetime movie! Mans inhumanity to man laid out to marvel at. Another great fast paced story from Ms. O'Brien. Very good story line. Sammy returns to Crimson Falls to get her mother out. Her father was murdered in Crimson Falls. This novella is well written and will keep you turning pages. 7 year old Stacy goes missing. There are secrets, buried truths and lies that keep you guessing. 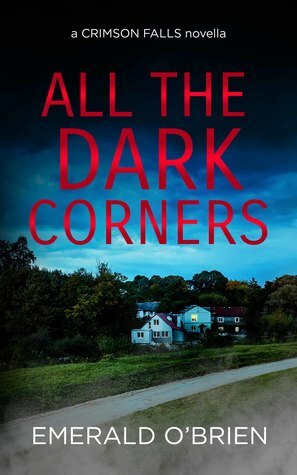 All The Dark Corners was the last book in the Crimson Falls series that I had requested and just like the other two, I absolutely loved it! The story was full of twists and turns and you don't know all that's at play until the very end. There's so much happening in this small book but one thing is for sure, you will not be disappointed! I discovered Emerald O'Brien last year when I read her Knox & Sheppard two book series and after reading yet another great story from her, I will absolutely All The Dark Corners was the last book in the Crimson Falls series that I had requested and just like the other two, I absolutely loved it! The story was full of twists and turns and you don't know all that's at play until the very end. There's so much happening in this small book but one thing is for sure, you will not be disappointed! A devious and dark, mind bending read. This story will have you gripped from start to finish. The twists and turns will have you guessing until the very end. Another great story from Emerald O'Brien - she never dissapoints me. This is a short but spine chilling tale about a town that brings out the worst in people - and you really don't want to be there in October. Samantha escaped the town's clutches a few years ago, swearing never to return. But now her mother has called asking for Sam's help to leave, too. The moment she enters the town the feeling that she shouldn't have come gets stronger and stronger. The ending was not what I anticipated. Five sta Another great story from Emerald O'Brien - she never dissapoints me. One weak link in the chain will break us all. Holy crap! What in the world did I just read? TWISTED! I loved every minute of it. Ms. O'Brien is a new to me author but I will for sure be looking up her other stuff! I love her style. In her latest book, O’Brien has penned a wonderfully devious story, filled with darkness and secrets that will keep you guessing until the very end. This story gripped me from page one. With a main character you love to hate and a sick and twisted mystery, this one will hold onto you long after you turn the last page. A definite five-star that will stay with me for a long time...be prepared the check ‘All the Dark Corners’ of your house after you read this creative and terrifying psychological s In her latest book, O’Brien has penned a wonderfully devious story, filled with darkness and secrets that will keep you guessing until the very end. This story gripped me from page one. With a main character you love to hate and a sick and twisted mystery, this one will hold onto you long after you turn the last page. A definite five-star that will stay with me for a long time...be prepared the check ‘All the Dark Corners’ of your house after you read this creative and terrifying psychological suspense. Wow - this book was awesome. So many twists and turns that you never expect. I highly recommend this book along with the others in the Crimson Falls Series. This was an amazing story that I have read. I am so in love with this story and I highly recommend this story to everyone. I can not wait to get the next book that this writer will write I love the writing style of the author. O’Brien writes another page-turner with her latest release in the Crimson Falls series. I loved the dark undertones and couldn’t wait to find out what happened next! Highly recommend this one, it was so entertaining! In this case what wouldn't you do? Crimson Falls is not a great place to live, or it seems to raise children. When Samantha Tillman is called home my her mother she goes as the dutiful daughter. Memories and current events come to light and everything is not the way it seems. Returning to Crimson Falls is never a happy homecoming. I love this story of Sammy. She comes back to Crimson Falls after her mom calls befging her to come back cause she was scared she was going to be killed by the same person who "killed" Sammy's dad. As she plans to take her mom away, her bf's, Will, daughter is taken in the middle of the night. Is she a victim of the curse, or is she found? Does Sammy find out the secrets her mom is hiding? Definitely a MUST read. I do not want to visit Crimson Falls, it is too scary. That being said this was a truly scary book with a lot of really strange people. Is Crimson Falls truly cursed or is it just the people who live there. They want to take revenge for any slight they feel has been done to them. There are many twists and turns in the story and it is very entertaining. If you love scary stories this is the book for you. Reminds me of a Dean Koontz type of book. I received an ARC of this book from the author, Emerald O'Brien, and this is my voluntary and honest review. This is an excellent mystery about who killed Samantha's Dad after she moved away from home. When she comes back home to help her Mom, she searches for the answers. You know it is a good mystery when you think you have the answers and find out you are wrong. This is a real page turner and a must read if you love a good mystery. I highly recommend it. This is the second book of Crimson Falls series I've read and, besides being totally different one to the other, it was as good as the first. Excellent author, keeps the tension of the story from the very beginning and is very fast reading!! I'll continue with another story of this serie, and expect to be great!!! Sam is so real. Emerald has her struggling with her own problems as she heads back home because of her Mom calling. The crazy twists and turns after that kept me up past my bedtime. Enjoy the book. I sure did. Great read!!!! I totally did not anticipate the ending. Looking forward to reading more of the novellas in the Crimson Falls Series. Twisted. Creepy. Chilling. Awesome! I truly love reading this author! It has been a good while since I have read a story like this. It did take me a minute to get into it. Once I did get into the story I could not stop reading. It has its mushy parts, it also has angst, suspense and thriller. Emerald O'Brien diffidently fits in Crimson Falls. All The Dark Corners is part of A Crimson Falls Novella series, they are all standalone’s and there is no reading order for the series. Emerald O'Brien is a new author to me, she did an awesome job keeping the book a part of It has been a good while since I have read a story like this. It did take me a minute to get into it. Once I did get into the story I could not stop reading. It has its mushy parts, it also has angst, suspense and thriller. Emerald O'Brien diffidently fits in Crimson Falls. Emerald O’Brien is a Canadian writer who grew up just east of Toronto, Ontario. Emerald studied Television Broadcasting and Communications Media. She graduated from the program at Mohawk College in Hamilton, Ontario. Her debut novel, Darkness Follows, is a New Adult Mystery and the first book in her most popular series, The Avery Hart Trilogy, is free on all retailers. When she is not reading or wr Emerald O’Brien is a Canadian writer who grew up just east of Toronto, Ontario. Emerald studied Television Broadcasting and Communications Media. She graduated from the program at Mohawk College in Hamilton, Ontario. Her debut novel, Darkness Follows, is a New Adult Mystery and the first book in her most popular series, The Avery Hart Trilogy, is free on all retailers. When she is not reading or writing, Emerald can be found with family, and friends. Watching movies with her husband and their two beagles is one of her favourite ways to spend an evening at home.